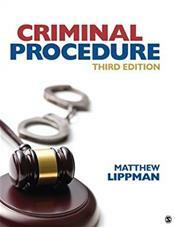 This contemporary, comprehensive, case-driven textbook from award-winning teacher Matthew Lippman covers the constitutional foundation of criminal procedure and includes numerous cases selected for their appeal to today.s students. Organized around the challenge of striking a balance between rights and liberties, Criminal Procedure, Third Edition emphasizes diversity and its impact on how laws are enforced. Built-in learning aids, including You Decide scenarios, Legal Equations, and Criminal Procedure in the News features, engage students and help them master key concepts. Fully updated throughout, the Third Edition includes today.s most recent legal developments and decisions.